Events are rapidly adopting location-based marketing as a natural strategy to organizers who already have an app. With location-based services, event organizers can avoid queues, long wait times, printed papers and lack of information to attendees in order to improve their experience at events. It has proven to be an effective tool because it is personalized, it reaches the audience timely, and it is very targeted. Mobile location-based marketing has the ability to not only improve the overall visitor experience but also provide ways of increasing the revenue for both the organizers and the exhibitors at the events. 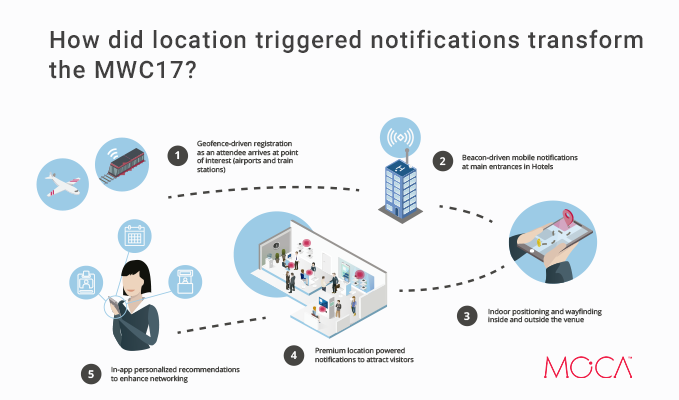 Fira Barcelona and GSMA have been using indoor and outdoor location technologies at Mobile World Congress for the past few years and the 2017 event in Barcelona was no exception. Powered by MOCA, Pole Star and MapsPeople, visitors and exhibitors benefited from context-aware communications, a dynamic wayfinding solution, indoor location-based services, and recommendation system based on machine learning. A network of 750 BLE beacons, provided by Pole Star, were deployed both in the venue as well as in the city and more than 45 million data points were analyzed by MOCA platform before, during and after the event. MyMWC official mobile app, powered by the joint solution, guided visitors through the 240,000 m2 of Fira Gran Via. Users received personalized suggestions such as people who to meet, exhibitors to visit and sessions to attend depending on their interests, behavior and micro-location. Moreover, exhibitors were able to engage one-to-one with visitors and bring them to their stands. The indoor wayfinding functionality, provided by MapsPeople, allowed visitors to get routing to their desired destination by a single click in the app. They were even able to get routes all the way from their hotel and to a specific stand inside the venue. Once inside, visitors had access to a dynamic map of the gigantic venue and could, for example, get live queuing times at all food outlets, which helped everyone optimize their time at the event. Finally, location-based audience analytics brought a powerful analysis to the event organizers, providing the necessary knowledge to understand the behavior and preferences of attendees to improve future events and adjust the layout of the giant exhibition facility. It also allowed event organizers to provide the audience analytics reports they needed to justify brand investment into sponsorship of the event. Interesting in learning more about the MWC project? 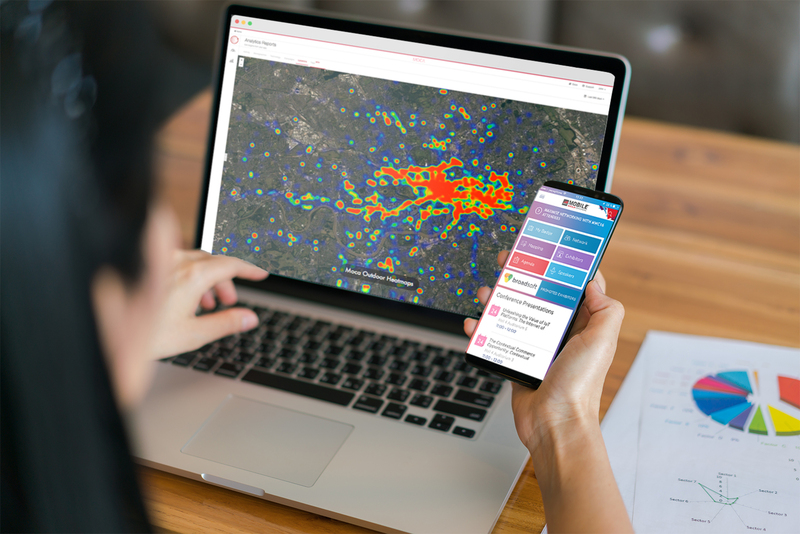 Download the full white paper and discover how to leverage location analytics and mobile engagement to enhance the visitor experience at events.